South China’s Guangdong province is seeking breakthroughs in the culture and tourism industries with Canada’s Alberta province, in a bid to further economic and trade cooperation between the two provinces, said Shen Haixiong, head of the publicity department of Guangdong and Chairman of Guangdong International Culture Association. The official made his remarks on Sept 26 during a visit to the Canadian province hosted by Sarah Hoffman, Alberta’s deputy premier and minister of health and Deron Bilous, its minister of economic development and trade. The officials attended a round-table conference on the development and challenge of 21st-Century media in bothGuangdong and Alberta, and reached broad consensus on enhancing cultural and tourist exchanges and economic and trade ties. During the meeting, the two Canadian ministers outlined for Shen Alberta’s recent economic and trade development and extended their congratulations on Guangdong’s achievements in economic and cultural development. They expressed their sincere hope of strengthening the cultural cooperation with Guangdong to achieve mutual benefits and win-win results. Shen said that Guangdong and Alberta are among the most active economic provinces in China and Canada, with rich cultural and tourist resources and strong cultural creativity. The two provinces should put the signed agreements into practice, according to Shen. A series of agreements on potential cooperation in various areas, including festival exhibitions, international training and production technologies for film and television, were achieved during the meeting. Alberta is known to the world for its Banff Mountain Film Festival while Guangdong is famous for hosting the Guangzhou International Documentary Film Festival, one of the most important such festivals in the world. 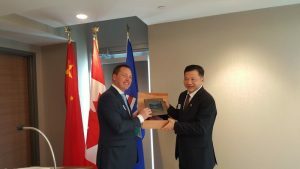 The Guangdong delegation also had discussions on challenges in the international influence of media with representatives from the Alberta economic development and trade department, the University of Alberta and Alberta media outlets.